Ranger Emboss It Ink Pad - Clear. Ranger's Emboss It Ink Pad contains a high quality, slow drying clear ink specially developed for use with embossing powders. Cover a stamp with the clear ink and press firmly on your project surface to create a sticky area on which to sprinkle embossing powders. Melt the powder with heat to set and you've just added a unique dimension and sparkle to your lettering, drawing, or craft project! The ink pad itself measures 2" x 3" within a 2-3/4" x 3-3/4" container. Ranger Ink Embossing Powder, Clear. 14g (0.5 oz). Ranger Ink &amp; Tim Holtz Distress Mini Ink - Forest Moss. 2,5 x 2,5cm. Acid free, water based. Tim Holtz Distress Resist Spray. 57ml. Tim Holtz Ideaology Found Relatives - Occasions. 24 pieces. Tim Holtz Ideaology Layers - Collector. 32 pieces. An eclectic collection of printed memorabilia. Ranger Ink &amp; Tim Holtz Distress Mini Ink - Old Paper. 2,5 x 2,5cm. Acid free, water based. Tim Holtz Ideaology Index Clips. 24 pieces. Ranger Ink &amp; Tim Holtz Distress Mini Ink - Walnut Stain. 2,5 x 2,5cm. Acid free, water based. 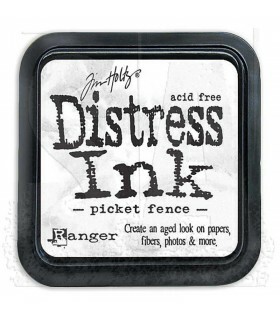 Ranger Ink &amp; Tim Holtz Distress Ink - Picket Fence (white). 7 x 7cm. Acid free, water based. Tim Holtz Ideaology Metallic Stickers Quotations. 4 sheets, 316 stickers. Ranger Ink &amp; Tim Holtz Distress Mini Ink - Victorian Velvet. 2,5 x 2,5cm. Acid free, water based. Tim Holtz Ideaology Transparent Tiles - Alpha. 96 pieces. Tim Holtz Distress Glitter Dust - Vintage Platinum. 50g. Ranger Embossing Powder - Princess Gold. 18g (0.63 oz). Ranger Ink Embossing Powder, Frosted Crystal. 45g (1.5oz). Ranger Ink &amp; Tim Holtz Distress Mini Ink - Aged Mahogany. 2,5 x 2,5cm. Acid free, water based.